Televisions and monitors can take up a lot of space and contain several hazardous materials such as Lead, Cadmium, and Mercury. Instead of illegally disposing of them in the trash or landfill bring them to California Electronics Recycler in Santa Ana, CA. It could save you from hefty fines. Why Should you Recycle your Televisions and Monitors? You should always recycle your TVs and monitors to keep them out of our precious landfills. TVs and monitors are made up of several different hazardous materials that are harmful to the environment. 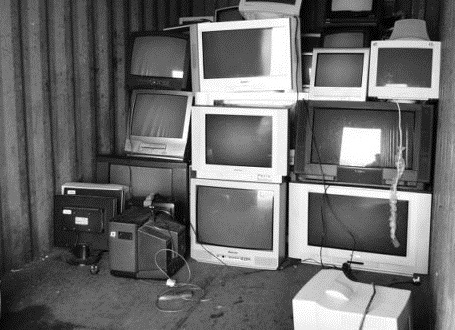 Old CRT televisions and monitors contain high levels of lead in the glass. Exposure to lead can affect mental and physical development and at high levels be fatal. They also contain cadmium which is another toxic element. Acute exposure to cadmium may cause flu-like symptoms including chills, fever, and muscle ache sometimes referred to as “the cadmium blues.” Symptoms may resolve after a week if there is no respiratory damage. More severe exposures can cause tracheo-bronchitis, pneumonitis, and pulmonary edema. In newer TVs and monitors such as LCD, LED, and Plasma displays, traces of mercury and other materials can be found and be harmful if exposed. It is also important to recycle your TV’s and Monitors because they contain rare materials that can be recycled and reused in new products and save money and precious resources for extracting more materials. They can take up a lot of precious space in landfills and take a long time to remove because of their size. If you have monitors or TV’s that need to be recycled call California Electronics Recycle at (800) 282-3927 today. You may be eligible for a free business pickup.